Thank you to our Bronze Partners! Ying Ying Wu is a loving AHH!meritus Member, a friend and supporter of AHH! Swi Shang Lin, and your youngest brother Yao Lin. They will live in your heart forever. Many thanks go to Laurel Smith, a long-time friend of Linda Somdal. to support AHH! and our Circle of Harmony Program! Sandy has always had a love of music, whether it was camp songs as a kid, Broadway shows as an adult, a panoply of musical performances at the Schuster Center where she volunteers, or singing in the church choir. After seeing our Chillin’ performance, Sandy was moved to contribute to Ahh! Cappella. Thank you for your loving support. — Barb Schultz. Thank you to our Copper Partners! Brenda is our wonderful Basket Lady - collecting toiletries for charitable organizations in the community. She also spends time selling and listing houses in the Conejo Valley so if YOU need to sell or buy a home - please contact Brenda and be sure to save your hotel toiletries from Bakersfield jaunts to help her spread a few more smiles. It brings Elaine great joy to see and hear the Agoura Hills Harmony Chorus! She appreciates our hard work and the talent that goes into our performances. Thank you - Genie Boruski for your contribution in honor of your brother's organization, Medicine for Humanity. Leo Lagasse, M.D. is president and co-founders of Medicine for Humanity. Click the link above to see the wonderful work they do. Thank you, Pete, for joining our Copper Partners. Muffoletto & Company is a full service accounting firm located in Woodland Hills. Whether your need is general tax, accounting, business management practice, support and/or services, Muffoletto & Company can assist you. Both AHH and Jafra has kept me looking YOUNGER THAN SPRINGTIME.... lyrics with which I am familiar! Thank you to all supporters of AHH! 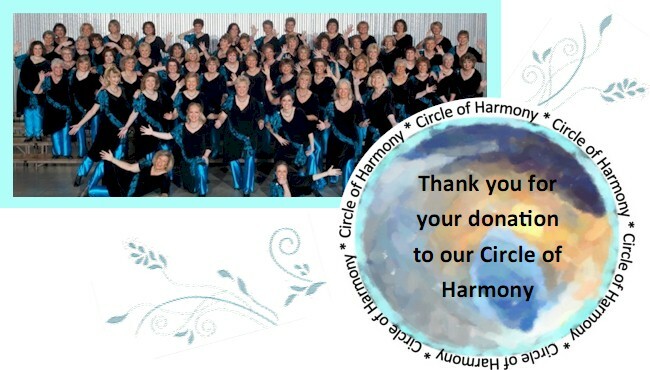 Click here to see how you can join the Circle of Harmony and become a sponsor!